Weighty Matters: Fake, or is the JDRF the world's least scrupulous health charity? Fake, or is the JDRF the world's least scrupulous health charity? If the photo up above is genuine, and not an Onion style fake, I think the JDRF has taken inappropriate Big Food/Public Health partnerships to a new all time low. 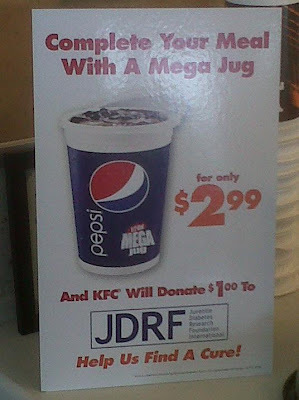 If genuine, then the JDRF is comfy lending its name to the sale of 64oz of sugared soda. For those who like numbers, the Mega Jug holds 800 calories and 56 teaspoons of sugar. That's over a full cup of sugar! But hey JDRF, who cares about sugared soda's role in the development of obesity and type 2 diabetes? Look! A a shiny dollar! Perhaps the saddest part of this story is that even if it's a fake, the fact that it's a plausible fake speaks volumes about the world we now live in.